When embarking on any bluewater passage, you need to consider the ramifications of being far away from shore. Also, many of the priorities and techniques of sailing change: safety, navigation, communications, etc. Most of us were taught that the primary emergency procedure is a VHF “Mayday” call. What do you do when you’re out of VHF range? How will you navigate when there are no landmarks? Being Prepared—First and foremost, by being prepared, many issues which would be emergencies to the inexperienced will be avoided. You won’t run out of fuel, food or water because you have planned your capacities and managed them properly. If you tear a sail or break a halyard, you will just take things down, repair them the best you can (with the spares and supplies you have on board and skills you have developed) and then put things back in order. Safety Equipment— Here is a useful safety-equipment checklist. Note that the safety equipment for inshore and coastal cruising can be inadequate for offshore use and Coast Guard requirements are a bare minimum for inshore and/or coastal use. 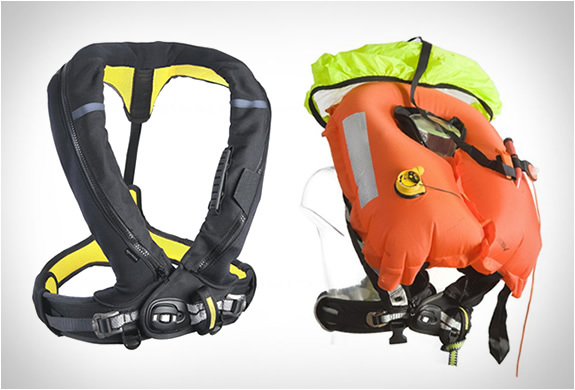 Instead of the big orange USCG-approved PFDs, you’ll want offshore-rated self-inflating life-vests with an integral tether-point, spray hood and leg straps (some of these are not USCG approved so you’ll still need USCG-approved PFDs on board for an inspection). We attached a Personal AIS MOB unit (aka Personal Locator Beacon or "PLB") to our life-vests (See image). Also, you’ll want a life-raft and a mount/stowage for it so it can be launched quickly. Your boat's EPIRB may be your most reliable method of signaling for help in an emergency (followed by a satellite phone and a Single Side Band radio ("SSB")). Be sure that all the safety equipment is sufficient for the size of crew you intend to have on board for long passages and is in good repair and properly serviced. When choosing spares, you’ll start with a basic list which includes sail-repairs, spare halyards, and rigging parts. Next, consider what’s likely to fail on your boat. If the engine’s older, you’ll want to carry more engine spares. If your boat is heavier (as Celebrate is) you’ll want to carry autopilot spares. Navigation—When you’re offshore, you’ll most likely be navigating by GPS. Whether you use electronic or paper charts, the most practical means of knowing where you are and your Speed Over Ground (“SOG”) and Course over Ground (“COG”) is to look at the GPS readouts. Because of the crucial nature of knowing where you are, carry several backup GPS units. On Celebrate, there are GPS units in the chart-plotters, and we have a hand-held as a backup which we also use for dinghy trips. Also, you can get GPS apps for your smart-phones so they can be pressed into service when needed. Communications—You have a number of options for communications—here’s what we carry on Celebrate: The main VHF has a masthead antenna with the main control at the nav station and a remote microphone/control in the cockpit. For longer-range communications, we have a SSB with a Pactor modem connected to a laptop for email (via SailMail). This is important for getting weather information. SSB communications are always hit-or-miss depending on the time of day and your position relative to the station you are calling, so we back that up with a hand-held SAT phone (the installed sat-phone failed even before we started our World Circumnavigation). Although seldom useful to us for voice calls, we used the SAT phone for email when the SSB did not connect. We also carried a Yellow Brick satellite tracking unit. Although we didn’t used all the features of the Yellow Brick, it can also be used for text messages and other communications. 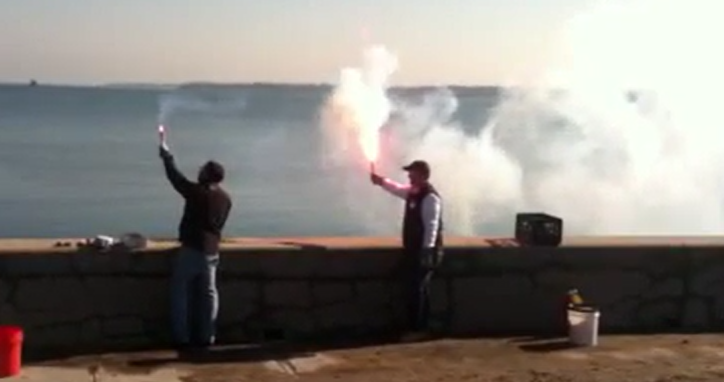 Compare the USCG-approved flare (left) and SOLAS-approved flare (right). If you really need a flare, you’ll wish you had SOLAS. Pack sturdy gloves and safety goggles with your flares, all flares are extremely hot. Click here to watch video. 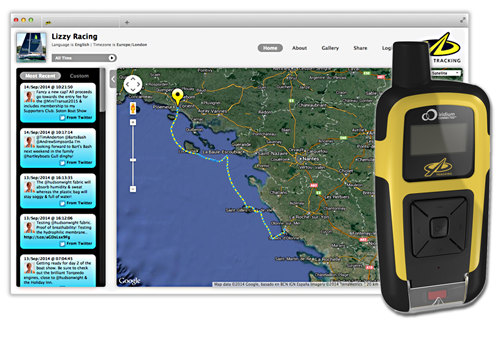 A Personal AIS MOB unit, attached to your life-vest will automatically mark its GPS position and sound an alarm on every AIS-equipped chartplotter within its several-mile range. An equivalent personal EPIRB has a world-wide range but the signal cannot be received on board and there will be a delay for the MOB position to be relayed to your boat via your SAT phone. A Yellow Brick sends GPS tracking information via Iridium SAT Phone technology to draw nice maps and allows messaging too. See ybtracking.com. Also, click here for Celebrate's World Circumnavigation track. Watch Commander timer by sailsafely.com is great for long watches. Watch Schedule—When you’re at sea, you’ll keep the boat moving. This means you’ll need a watch rotation which maintains an adequate lookout at all times. To see what works for you and your crew, try a number of different schedules. The off-time for sleeping was a more compelling part of the watch schedule than the on-time. We both prefer a minimum of 6 continuous hours for sleep. Rotating the watch did not seem worth the negative impact it had on the sleep schedule. Autopilot—To make the watches easier you’ll need an autopilot. We can hand-steer for a short period of time but hours at the wheel are too fatiguing for the short-handed crew. Unless you have sufficient crew for one-hour or two-hour steering stints, you’ll be relying on the autopilot most of the time. 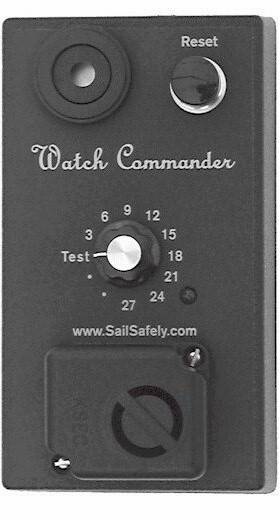 Staying Alert—On Celebrate we have a “Watch Commander” by SailSafely (one of the few specific products I suggest). It reminds the helmsman at a preset time interval to check the boat and reset the timer. If not reset, a loud alarm will wake the off-watch crew. Many cruisers use a kitchen timer but it doesn’t have the alarm feature. The Watch Commander is particularly valuable for night watches but we use it 24-hours a day. Ocean passages can be tedious and the on-watch person needs to be present in the event of wind-changes, traffic, upcoming weather, etc. We set the timer for 15 minutes, so every 15 minutes the on-watch person checks the instruments, adjusts the autopilot course if necessary, scans the horizon 360-degrees, checks the radar, looks at the sail-set, etc. Then the watch person is free to take a break, write log entries, get a snack, go to the head, etc., knowing that the timer will remind him for the next look-about. Nighttime—If you’re sailing 24 hours a day, roughly half your sailing will be in darkness. Reefing, sail trim, and repairs will not necessarily wait for daylight. Here’s one area where a few low-cost changes can make a great improvement in safety and convenience. Get red/white headlamps and add red/white cockpit lights so you can see control lines in the cockpit. Also, mark reef-points on your halyards or furling lines—better-yet, mark the lines with whipping as well which you can feel in the dark. On Celebrate we have great spreader lights. If you need to do something on deck at night, with the spreader lights, it’s like daytime. In Fiji, we added a spreader-light switch in the cockpit as well and instituted a new rule: Any trim change whatsoever, you must turn on the spreader lights. That way you could check that everything was clear (like boom and whisker pole not against the shrouds, lazy genoa sheet not fouled, etc.) before changing the sails. Before the cockpit switch was installed, one might have thought it was just too much trouble to go below, turn the lights on, make a sail-set change, then go below and turn the lights off. You still need a spotlight to see the sails above the first spreader, but many potential problems are at boom-level. For spotlights, we use very high intensity LED flashlights. These will fit in a coat pocket and are just as bright as many of their larger cousins. End of Part 2, to be continued next week.